Following a hugely successful tour to the region in 2016, we are delighted to continue our relationship with the Chicago Symphony Orchestra as it returns to Asia this month. For their ninth Asian tour, the orchestra and Music Director Riccardo Muti will return to audiences in Taipei, Shanghai and Beijing with two programmes: Brahms Symphonies Nos. 1 and 2, and Tchaikovsky Symphony No. 5 and Rimsky-Korsakov Scheherazade. 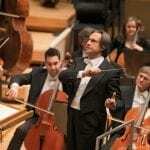 Previous tours with the Chicago Symphony include visits to Asia and Europe with Bernard Haitink in 2009, plus a European tour in 2017 during which it became the first international visiting orchestra to perform at the Elbphilharmonie in Hamburg, and Riccardo Muti returned to La Scala for the first time since 2005. View all our projects with CSO here. Following the six performances in mainland China and Taiwan, they will then travel on to Japan for concerts in Osaka and Tokyo. Keep an eye on csosoundsandstories.org for news and photos from the tour.